Travelpro usually includes a lot of variety in their luggage collections, on the Crew 11 is no different. There are both softshells and hardshells to choose from, as well as some rolling totes, suiters, backpacks and a few other types of bags. With so many different suitcases, it can be hard to pick out the best ones. And that's where I come in - I did all the work so that you don't have to. In this detailed review, I will show you only the best luggage from the Travelpro Crew 11 collection. And keep in mind that this particular brand was designed specifically for cabin crew. So, if it's good enough for those who spend most of their time in the air, there's no reason it won't be good enough for you! Just the suitcases. The Crew 11 collection actually features a lot of different types of luggage, and if I were to tell you about every single item I'm afraid I would bore you to death. So, we'll stick to suitcases for now - both hardshells and softshells. You can expect to read about all of their features, both the good and the bad. 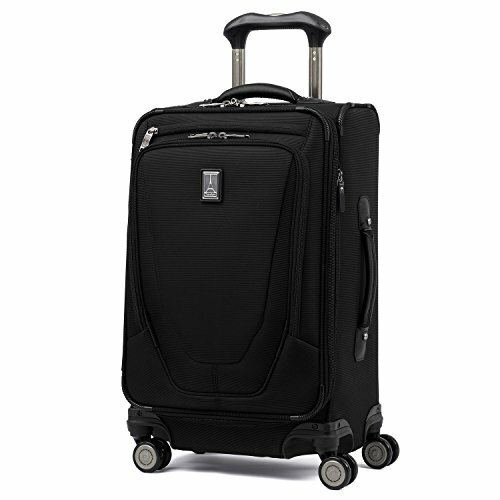 In addition to that, we'll mostly talk about luggage with spinner wheels, since it is much more convenient for air travel. But that doesn't mean that we'll completely skip the rollarboards, so expect to see a few of those as well. I will give you the exact specifications of each piece of luggage wherever possible, so that you can be 100% of what you are buying. Keep in mind that luggage under 22" is usually excepted inside the cabin, while everything larger should be checked at an airport. But, we all know that depends on the airline that you're flying with, and you should always double check what their requirements for carry on/checked luggage are. 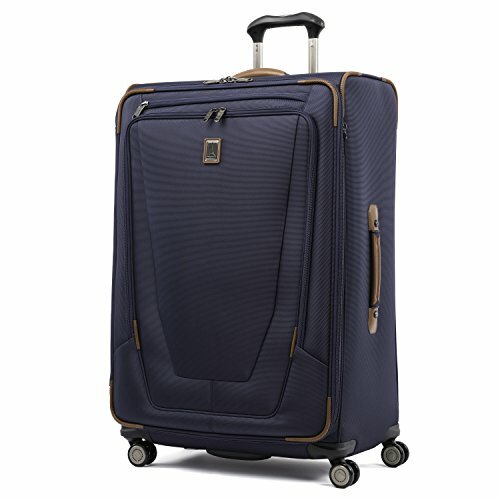 One thing to note is that the overall dimensions of these suitcases are representative of their size including both the handles and the wheels. So, the actual body of the luggage is going to be somewhat smaller. But most airlines will tell you what the overall dimensions they allow inside the cabin are, which is why we are focusing on them. And with that in mind, you can see that the first and the smallest suitcase is perfectly fine as a carry on - its 21.5" height conforms to carry on requirements form the vast majority of airlines. Sometimes you might also be allowed to bring 21" expandable spinner suiter and the 22" rollarboard suiter inside the cabin, especially if you are flying in a rather large plane. But you will need to check with the airline you're travelling with. There is something else that stands out to me - the weights of these suitcase. 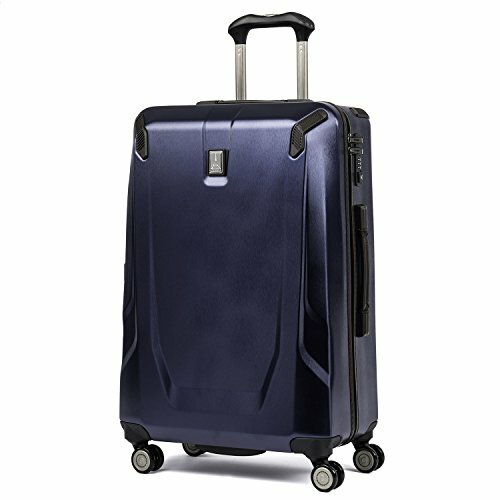 When you compare them to some other luggage, say the Travelpro Maxlite 5 collection, you will notice that they are kind of heavy. Especially when you also consider the fact that we've seen carry on suitcases that weigh only 4-5 lbs. But, given the fact that most luggage here is also equipped with a USB port and an internal suiter section, it's understandable that they're slightly heavier than some other suitcases. In the rest of this section of the review we'll talk about all the features that this Crew 11 luggage is equipped with, and whether or not we love them or hate them. 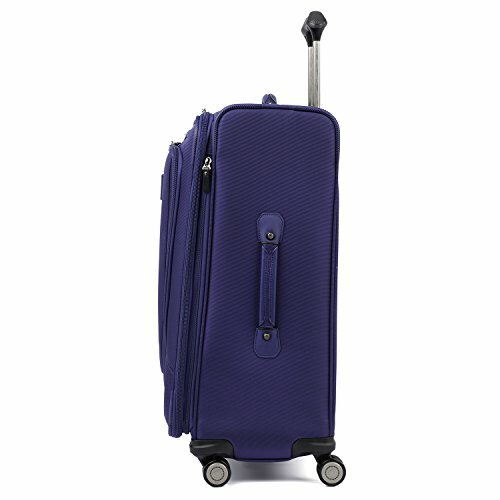 So, four out of five of these suitcases feature double spinner wheels, and that's what we'll talk about first. Personally, I much prefer spinner wheels to in-line skate wheels, because they are so much easier to manoeuvre. In general, a spinner wheel is a wheel that is able to rotate 360 degrees. And what that means is that you do not need to tilt your luggage to get the wheels rolling - you can wheel around your suitcase however you like. The particular wheels that we see on the Crew 11 suitcases are actually self-aligning magnetic wheels. That means that they will roll straight in any direction, allowing you to glide through the airport easily. One downside of these wheels is that they are slightly more sensitive than regular skate wheels. To ensure their longevity you should avoid wheeling your luggage up or down the stairs and across any rocky or uneven terrain. 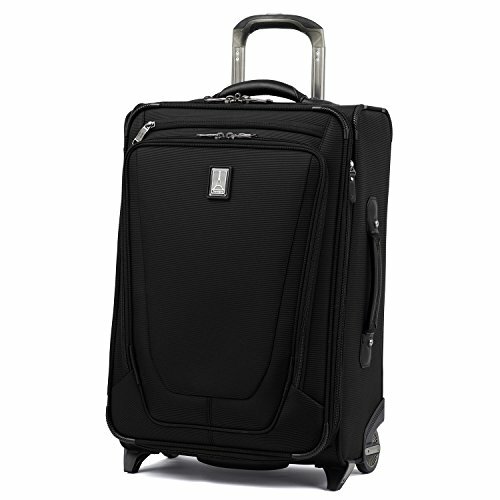 Now, the 22" expandable suiter is the only piece of luggage that doesn't have spinner wheels. But its regular skate wheels do have a few features worth mentioning - the crash guard wheel housings, the skid guards and the molded corners for extra durability. And generally, even though these might not give you as great manoeuvrability as the spinner ones will, they will endure rugged conditions a little bit better. All of the softshell Crew 11 suitcases are built from Ballistic Nylon. This is a very sturdy and durable material, and it is frequently used in luggage and travel bags precisely because of those properties. In addition to that, Ballistic Nylon is also water-resistant, even when it is not coated with anything. So, you can expect your Travelpro suitcases to live a long life, at least in terms of the quality of the material they are made of. One more thing to note is that all of these suitcases also feature DuraGuard coating, which enhances their stain and abrasion resistance. Overall, it is pretty much the perfect material for this type of luggage. There's two things to talk about here - the telescopic wheel handle and the carry handle. Let's start with the latter. 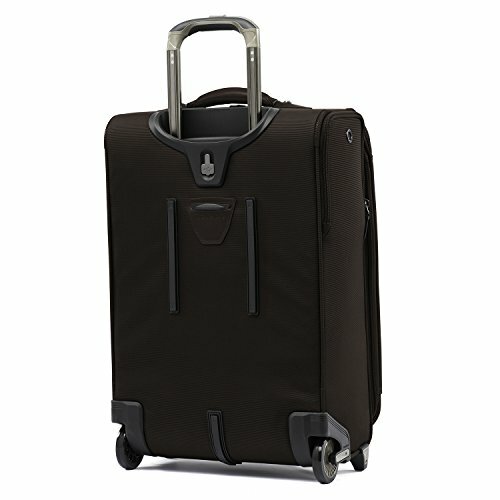 The carry handles of the Crew 11 suitcases are low profile, and they are made from premium leather. That means that they should feel soft in your hands, but also sturdy enough that you don't have to worry about one of them getting ripped from the body of the suitcase. Oh and you get two of them - one on the top, and one on the side. The wheel handle, on the other hand, is arguably a more important feature. It is what ultimately determines how easy it is going to be to steer your suitcase. 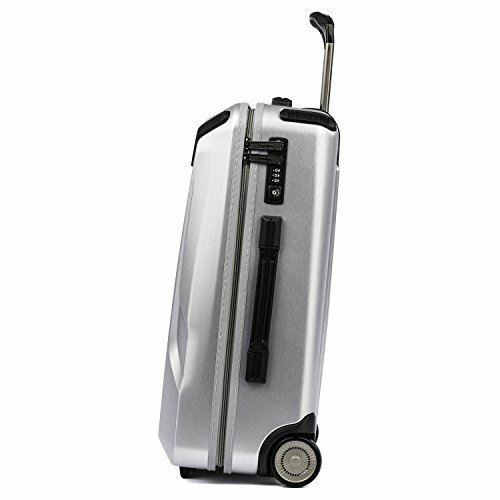 So, it is a really good thing that the handle on this luggage is made of airline-grade aluminum - the sturdiest and most lightweight material used in telescopic luggage handles. It's called the Power Scope Handle, if you want to know all the details. And in addition to that, it can be locked into several height positions, which I absolutely love. This means that it will be easy for people of different heights to adjust it to fit them perfectly, which is something we don't really see that often in luggage. At least not as often as we should! The single packing compartment should come as no surprise - after all, it is the standard for softshell suitcases. But all the other features hidden inside could surprise you a little, like the multiple zippered pockets (including a dedicated pocket for wet items) and the suiter section that is included in every one of these suitcases. There are also elastic tie down straps in the bottom compartment, which will keep all your belongings in place. I actually prefer these to cross-straps, since these are less likely to wrinkle your clothes. One more characteristic of the Crew 11 luggage collection is expandable capacity. And that's something all of these suitcases have in common - you can get two extra inches of packing space when you decide to use the expansion zipper. If you're anything like me, and for some reason return with a heavier suitcase than you left with, you will find this feature very useful. Sometimes you won't arrive at the airport in time to charge your phone. And flying overseas with a dead phone is never phone. So, I think you will really enjoy the fact that the Crew 11 suitcases feature a dedicated pocket for your power bank. It is on the side, and it's barely noticeable. You put the power bank in there, and then just drag the cord through the USB port on the back of the suitcase. 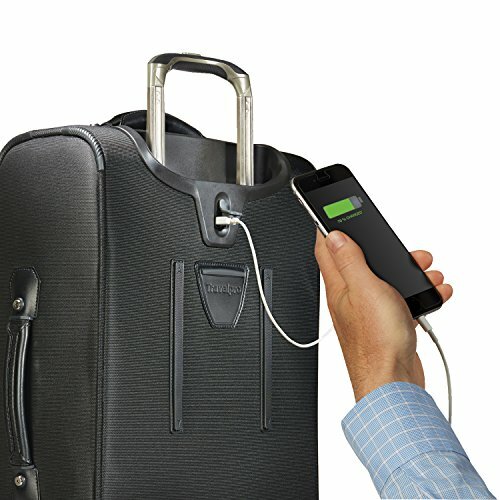 This will allow you to charge your phone on the go, while you are just standing in line or even while you're having breakfast at the airport cafe. And without having to dig through your other bag and trying to figure out which cable is the one you need for the power bank. If you generally like traveling super organized, then you will most definitely love this feature. I know I do! Just keep in mind that this feature is not found on the 25" and 29" Crew 11 suitcases. Two external zippered compartments. You know that feeling when you finally zip up your suitcase and then you see a t-shirt lying on your bag that you somehow forgot about? Well if that happens with your Crew 11 suitcase, you can just throw it in one of the two external compartments. An awesome feature for the forgetful travellers! No locks. This is something I'm not really a fan of, but which is honestly a frequent occurrence on softshell suitcases. No, you won't get a lock which will allow you to secure the contents of your luggage. But you could always get a TSA padlock and use that, if you want to have some extra peace of mind while you travel. And this is pretty much the only thing that I don't like about these Travelpro suitcases, so I think that the pros really outweigh the cons. And that's it. Now, let's talk a little bit about the hardshell suitcases. What's really interesting here is that the suitcase without spinner wheels is actually the lightest suitcase out of the bunch. It is also the only one that will definitely be allowed inside the cabin, since its total height is under 23". You will also probably be able to use the 21" spinner as a carry on, but you will have to check with your airline first since it is taller than 23". When it comes to the USB port, you can see that the situation here is pretty much the same as with the softshells - the smaller suitcases have it, while the two larger ones don't. In terms of weight, I find it surprising that these suitcases are heavier than the softshell ones. That is usually not the case with hardshells, especially since these have similar (and slightly smaller) capacities than the other Crew 11 suitcases we check out. But it is what it is - they are still a better choice for air travel, especially if you are looking for checked baggage. And we'll talk about why that is in a minute. First, let's check out what features these have in common with the softshell Travelpro suitcases. Double spinner wheels. Well, all of them apart from the carry-on rollarboard, which is obvious from the photos. But generally, spinner wheels offer excellent manoeuvrability of your luggage, and allow you to roll it in whichever direction you want, without having to tilt your suitcase to get them rolling. Telescopic aluminum handle. The wheel handle on these hardshells is exactly the same as on the softshells. It is made of airline-grade aluminum, and it can be locked into several different height positions, which mean that most of you will be able to adjust it to fit you perfectly. Premium leather carry handles. Just like on the softside Crew 11 suitcases, we find two leather carry handles on the hardsides. They are comfortable and soft, but sturdy enough to endure the weight of this luggage at their maximum capacity. USB port. I already mentioned this, but just to confirm: the smaller two suitcases are equipped with a USB port on the back. But, unlike the softshells, these don't have an external pocket for the power bank. Instead, the power bank is supposed to go inside the suitcase, where its dedicated compartment is hidden. Which is less convenient than an external compartment, but only slightly. At least that's how I see it. The hardshell Crew 11 suitcases are made of Polycarbonate - one of the best (and most expensive) materials used in this type of luggage. I love this particular material because it is incredibly lightweight, but also really sturdy at the same time. This luggage is built to endure tough love from baggage handlers, and it shows. The only issue you could have with Polycarbonate is that it scuffs easily. Especially when your suitcase has a smooth surface, like these Travelpros do. That also means that the scuffs will be even more visible, and your suitcase won't look brand new for a while. I suggest you invest in a luggage cover, to protect your Crew 11 suitcase's exterior. Just like a single packing compartment is the standard for softshells, so are the double packing compartments the standard for hardshells. 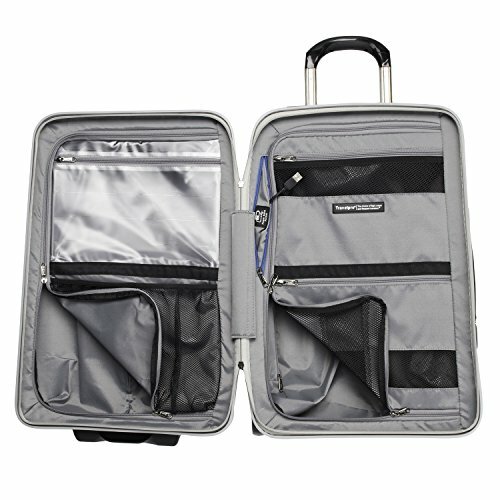 But what is somewhat surprising is the number of pockets you get inside these Travelpro suitcases, in addition to two full-panel dividers. I really like this - there is a pocket for everything you would want to keep separate. 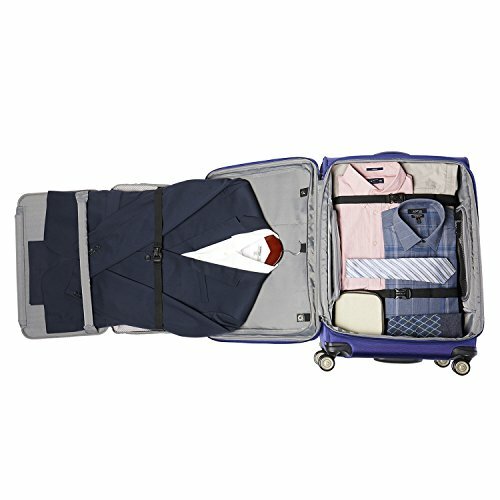 And the fact that the bottom compartment of the suitcase features pockets on both sides of the divider is incredible! I can honestly say that it's the first time I'm seeing this. If you like to organize your belongings when you travel, then you are going to fall in love with this suitcase. Just imagine being able to find a separate pocket for every charger and cable you need, and not finding them completely tangled when you arrive at your destination! Anyone who frequently flies to the States knows how important it is to have a TSA friendly lock on your suitcase. For one thing, it will keep your belongings extra safe. But any lock can do that. You want a TSA lock if you visit the US often because of TSA agents. They can decide to choose your suitcase for a random inspection, and when you have a TSA lock, then can easily open up your luggage with a master key, and then lock it up when they're done. On the other hand, if your suitcase has a regular lock, then they will have to open it up forcefully, which could break your suitcase beyond repair. So, my first choice for a carry on would be the Crew 11 International Carry On Spinner. It is the smallest out of all the suitcases in this review, and it is just the right size to be allowed inside the cabin. It's also equipped with a bunch of useful features - magnetic spinner wheels, a telescopic aluminum handle that locks into several height positions, USB port, multiple external pockets and expandable capacity. Seriously, there's nothing I don't love about this suitcase! A close second would be the 21" Slim Hardside Carry On Spinner. And it is my second choice simply because it is slightly carrier than its softside counterpart. 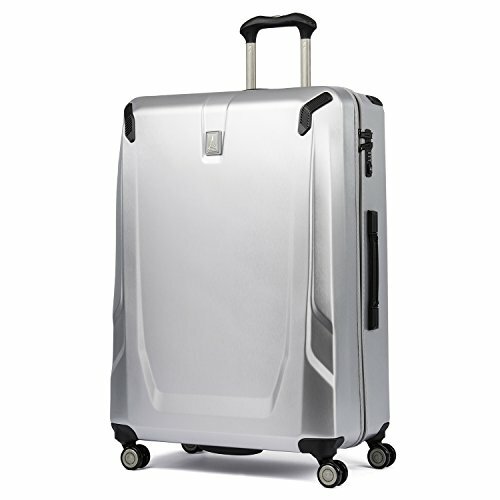 But it is also a really good suitcase - it is made of Polycarbonate, which is a very lightweight and sturdy material. Plus it has a bunch of different internal pockets, a TSA friendly lock, magnetic spinner wheels and a telescopic wheel handle! What's not to like here? 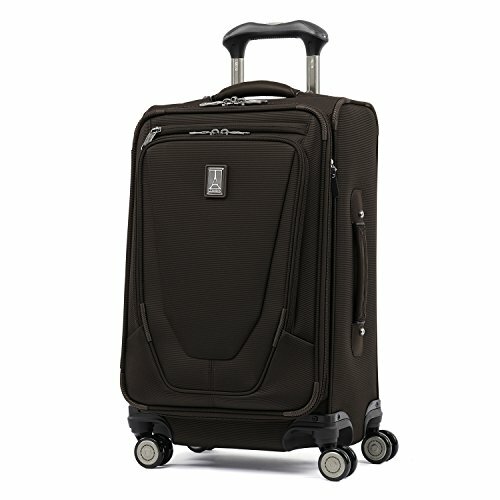 In terms of larger suitcases, my first choice would be the Crew 11 25" Hardside Spinner. 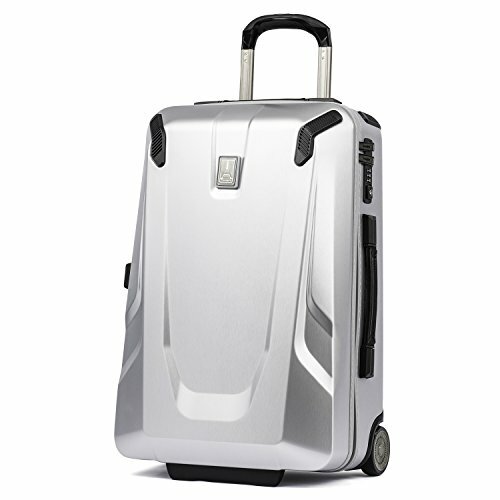 It has a capacity of almost 80 liters, which is more than enough for a longer trip. And this suitcase has a TSA friendly lock, so you won't have to worry about the safety of your belongings at all. And the lock is in addition to two full panel dividers inside, an abundance of pockets and magnetic spinner wheels. Do you really need anything else? And last but certainly not the lest, is the Crew 11 29" Expandable Spinner Suiter. I prefer this one over the hardshell one simply because it is lighter than it, in addition to having a larger capacity. So if you're looking for the most practical large suitcase you can get, I would say this is it. 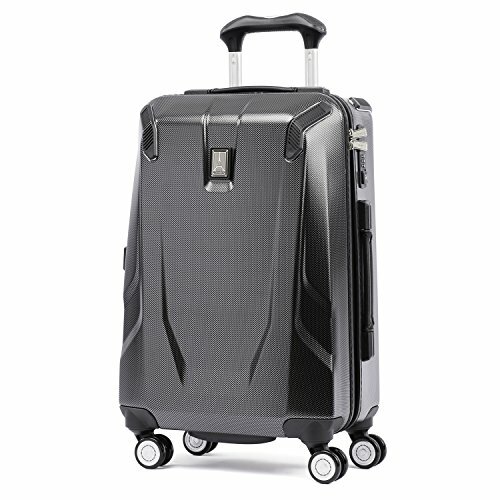 You'll love the double spinner wheels, the suiter section inside and the multiple external and internal pockets! And did I mention the aluminum telescopic wheel handle? Now I did!